Plaque of “Snow Leopard Mask” Consisting of Two Facing Ibex Heads and Flying Bird. 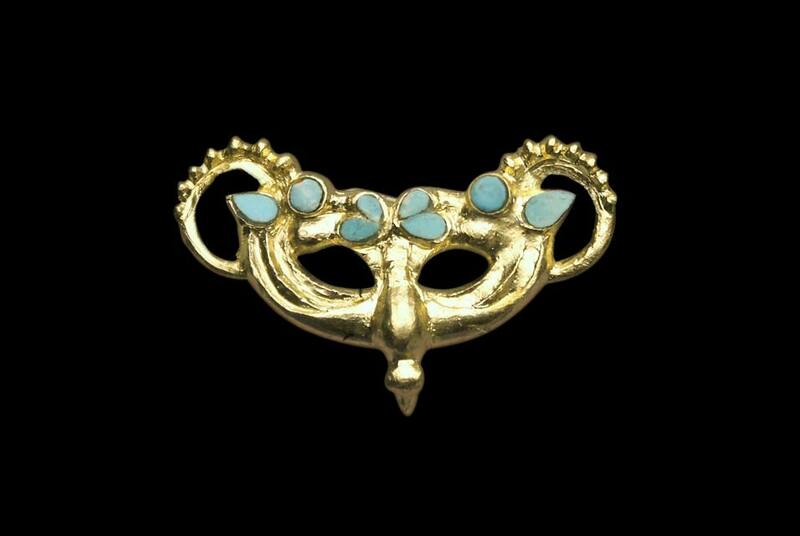 Gold, Turquoise. Shilikty 3, Kurgan 82, 8th-7th C. BCE. H x W x D: 1.56 x 2.48 x .2 cm. Central State Museum, Almaty: KP 26862. Photo: © The Central State Museum of the Republic of Kazakhstan, Almaty. WASHINGTON, DC.- The first U.S. exhibition devoted entirely to the nomadic culture of ancient Kazakhstan makes its Washington, D.C., debut yesterday at the Smithsonian’s Arthur M. Sackler Gallery. “Nomads and Networks: The Ancient Art and Culture of Kazakhstan,” on view through Nov. 12, dispels the notion that nomadic societies were less developed than sedentary ones. More than 150 objects of gold, horn, precious gems, and organic materials, most excavated within the past 15 years, reveal a powerful and highly sophisticated culture with strategic migratory routes and active networks of communication and exchange. “The topic of nomads and ‘net workers’ has special relevance to Washington, D.C.,” said Alexander Nagel, curator of Ancient Near Eastern art at the Freer|Sackler. “Washingtonians are by nature nomads who are traveling through the city for a limited period of time, giving the exhibition a unique connection to D.C.” For more than three millennial, nomadic society shaped the cultural landscape of the Eurasian steppe. In southern and eastern Kazakhstan, carefully determined migratory routes traced paths between lowland pastures, used in the winter, and alpine highlands, occupied in the summer. “Nomads and Networks” explores a form of Eurasian nomad-ism centered around an elite culture of horseback warfare. While not fully developed until the Iron Age, this unique way of life spread quickly across the Eurasian steppe, yielding the magnificent objects on display in the exhibition. On loan from Kazakhstan’s four national museums, the exhibition offers insight into the lives of the people of the Altai and Tianshan Mountain regions in the eastern part of the country from roughly the eighth to the first centuries BCE. “Nomads and Networks” presents spectacular, superbly preserved finds from Berel, an elite burial site of the Pazyryk culture located near the border with Russia, Mongolia and China, where permafrost conditions enabled the preservation of rare organic materials. Set amidst vast green grasslands in a visually stunning landscape, the burial mounds (kurgan) yielded hundreds of finds and allow insights into a long-hidden culture. Each kurgan contained at least one horse, sometimes many more, and the exhibition illuminates the central role of the animal in Pazyryk culture. Through remarkable works of art, visitors encounter a people fascinated by their encounters with nature and animals.